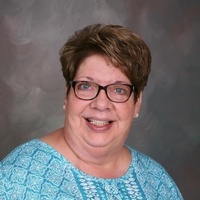 Janet L. Gingerich, 61, Topeka, passed away on May 16, 2018, at Parkview Regional Medical Center in Fort Wayne. She was born Oct. 23, 1956, in LaGrange, to Carl and Mary (Stump) Folk. She married Perry Gingerich on Nov. 24, 1984, in Ligonier. She is survived by her husband: Perry Gingerich of Topeka; her parents: Carl and Mary Folk; sons: Nicholas (Mandi) Gingerich of Topeka; and Ross (Ashley) Gingerich of Wawaka; eight grandchildren; brothers: Ray (Jodie) Folk of Topeka; Calvin (Debra) Folk of Goshen; sisters: Lisa (Dan) Miller of North Webster and Carla Bailey of Ligonier. She was preceded in death by her son Michael Gingerich. She worked at Westview High School for 25 years as the commodities clerk. She enjoyed spending time with her grandchildren and was a loving wife, mother, grandmother and sister. Friends and family will be received from noon-6 p.m., Saturday, May 19, and from 2-6 p.m., Sunday, May 20, at Emma Mennonite Church, Topeka. The service will be at 1 p.m., Monday, May 21, with one hour of visitation prior to the service at Emma Mennonite Church in Topeka. Pastor Gene Hartman of Emma Mennonite Church and Donna Holcomb of Helmer United Methodist church will officiate. Burial will take place at Hawpatch cemetery in Topeka, IN. Memorial contributions may be made to the family. Yeager funeral is in charge of arrangements.